Amazing story about an Australian Mum who's body warmth and breast milk revived her premature twin boy whom the doctors had pronounced dead. 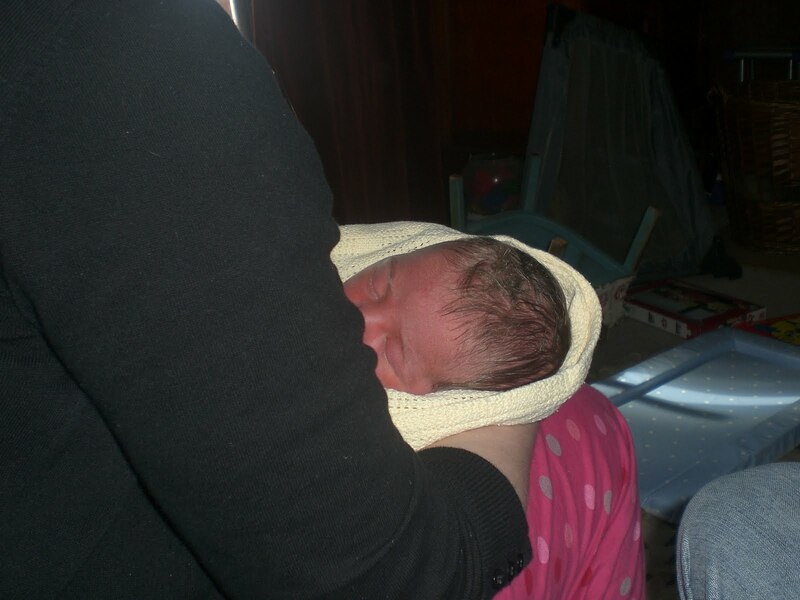 Hi Patricia here is my birth story for you. Started having regular contractions every 10 minutes from 23.30 20th Aug for five hours, breathed through them, then managed to get some sleep, waters broke at 8.15, forewaters only, some niggly contractions followed but not regular, sat on ball. Took some arnica and pulsatilla and mild contractions approx every 5 mins. Phoned BBC and were asked to come in as regular and waters broken, stayed in for an hour then sent home (4cm, thinning cervix and softened), contractions more intense but still 3-5 mins apart. Would have preferred to stay at home for a bit longer anyway so quite happy! Taken pulsatilla, caulophyllum and arnica, keeping moving, waters clear. Once home went on ball then into shower as contractions intensified, moving, hip circles, vocalising, contractions now 1-2 mins apart, lasting 1-1.5 min, rang bbc, closed so go into labour ward, got midwife we knew, walking from car park got things going after car journey. Contractions starting each min, intensified again, on all fours, leaning over chair, vocalising, using homeopathy kit, got to panicky point so used aconite, felt like transition so midwife asked for exam, agreed, only 6 cm, midwife estimated maybe another 8 hours before birth, tried some more felt starting to push, felt couldn't cope with that much pain, losing focus, on all fours crouched on floor, asked for pain relief, discussed with Doug, tried gas and air, couldn't breath/vocalise so stopped, asked for diamorphine, injection at 1755, was able to move to better position, kneeling on bed, gravity working, felt lucid and focus returned, pushed and felt I knew exactly what was happening, robert david mclean born at 1840. midwife said was a treat seeing normal birth! Baby unwrapped cord from neck twice, passed through legs for me to hold skin to skin, cord left to stop on its own then clamped, I cut it as was short again. Had synometrin for placenta as started bleeding a lot. Breastfed while placenta being delivered. I felt I made the right decisions for me to have a good birth experience. Couples workshop helped, Doug massaged my back throughout and breathed with me, knew the homeopathy kit and techniques, very lovely and supportive, stuck up for birth plan and helped me hang on without pain relief for as long as possible! Baby was alert and responsive straight away, and fed well immediately. short as my labour cetainly was. so I was unsure whether this may be a helping hand to get him to move. I politely asked whether I could have my baby!! and Eleanor said yes. birth and to for us to have such a fantantic time meeting my boy! I woke up at 7 in the morning, despite having been up half the night with Rosa, my teethy two year old. I thought that I felt a tiny pop but thought I’d probably imagined it as Ithan wasn’t due for another 10 days. I tried to go back to sleep and drifted a bit but started to feel like the baby was poking me really low down and so decided to get up and make tea. When I got out of bed I noticed a small wet patch and started to wonder if baby might on his way. I wrote my diary for a while wondering if it was really happening and cursing the fact that we had decided to start decorating the dining room the day before so the house was total chaos. Not the lovely clean tidy environment I’d imagined giving birth in at all! By 8.30 the poking feelings had turned into definite period type cramps and I had to go to the loo for a huge pooh so I thought it really must be happening and I’d better wake Gareth up and tell him the baby was on his way. As things were still really quite mellow I didn’t feel any urgency as my labour with Rosa had been about 14 hours, the first 6 or so were fairly relaxed. However by halfway through Rosa’s breakfast I was starting to find it hard to concentrate and the contractions were definitely getting stronger. Gareth phoned the hospice, where we had arranged for Rosa to be while we had the baby and they were great and said they’d get her room ready, bring her straight in. I phoned the labour ward and had a chat with them and they said they’d find someone to come out . None of us thought there was any rush though as I could still concentrate enough to make sense during contractions. They said the midwife might be a while but that sounded fine as I thought it might give us some time to sort our chaos out. G whisked Rosa off and although she had been quite amused by the noises I was starting to make I was relieved as it meant I could fully concentrate on the physical and what was happening. I went and sat on the loo again and it all reached another level of intensity. I started sounding and it really helped my breathing and to focus on thinning and opening. I felt so much more aware of the process this time and of everything we had learnt both in the hypnobirthing and the active birth classes. Last time I felt like the hypnobirthing fed in and really helped but it was on a subconscious level. This time I felt I was consciously drawing from what I knew. I decided to get in the bath. I thought it would help and if it slowed things down a bit it wouldn’t be a bad thing either. G came home as I was trying to run the bath and helped me into it. He then did a super human high speed hoover and tidy. I was feeling like everything was going on very low down and I was really starting to push. Gareth had been timing my contractions and said that when he’d started they’d been 30 seconds long and three minutes apart and the gaps just got smaller everytime until there was barely a minute between them. I felt they were coming in waves the whole morning but the sets were definitely increasing and getting closer together. I was using the sounding more and more, I surprised myself by how loud I was, mostly using ooooh! and AAAAH! As my surges got deeper and intensified so did my voice. It really felt like I was using my voice to push and squeeze downwards. G had to give me a lot of support to get out of the bath. I had to hang off him every time a contraction came and there wasn’t much time in between them. Eventually we made it into the sitting room. I felt so happy when I saw it, I think I hadn’t really been able to imagine giving birth in there as we had had to go to hospital at the crucial moment last time. Gareth had made it really lovely, or so it seemed to me. It was clean and uncluttered and everything was covered in throws and towels. I think my only moment of anxiety had been at the beginning when I realised it was really happening and the house was such a state. I couldn’t even really sit down anywhere let alone imagine giving birth. I felt huge relief and love for him. All of this in the blink of an eye between fast and furious surges. I asked Gareth to sit on the sofa and I knelt on the floor resting on him in between and braced by him during contractions. By this point I was really roaring, proper effective pushing with my whole self. My voice was deep down roaring him out. I said to G at that point it felt fierce, I think that describes the physical sensations really well but I felt fierce too. I needed to sit back for a moment and I leant my back against the birthing ball while kneeling with my legs apart. This was really intense and when I put my hand down I could feel his head. It was amazing and so exciting. I wasn’t at all bothered that the midwife wouldn’t be there. I didn’t feel like I needed anyone else. I felt a bit stuck in that position so we went back to the sofa. From then it was maybe two or three more pushes and I felt his head be born, it was the most wonderful and satisfying feeling. In a strange moment of clarity I saw the midwifes car pull into the drive. Another push and he came out with a splash onto the floor, he started to cry straight away . Gareth got out from under me and picked him up in a towel. I was stretched forward, panting on the sofa, everything felt like it was in slow motion. G told me he was a boy and I kept saying hello baby without moving, he asked me if I wanted to hold him but I needed to just stay where I was for a moment. The midwife knocked on the door and G shouted for her to come in. She came into the hall all of a bustle saying sorry she was late, traffic etc. and she came into the room and said oh my god you’ve delivered! It was perfect timing as far as I was concerned as she was able to do check him out and make sure my placenta came out completely, which it did without the need for the third stage injection. Ithan and I had lovely naked cuddles for quite a while until the cord was cut after the pulsating had stopped. He didn’t feed straight away but nuzzled around lots and I felt elated and so very lucky. I had a tiny tear but it didn’t need stitches so by lunchtime the midwife had gone and we were eating scrambled eggs on toast and wondering if it had really happened! Thank you so much for helping me to have an amazing birth experience. I will treasure the memories of Ithan’s arrival for ever. The classes empowered me and meant I felt confident and in control and was able to trust my body and my baby completely. Baby Callum arrived 1st June, so 11 days late. I’m sure the Clary sage and the reflexology points worked because as soon as my sister had finished massaging my feet the contractions were reasonably strong and regular! Thank you for your help and advice and I’m so glad I came to the classes it made a huge difference! The birth went well, I started on Bracken and then got moved up to the labour ward as Callums heart beat was racing. After lying on my back for an hour with a monitor strapped nice and tight to my belly, they decided all was well and I got moved back to Bracken. Things were going well until my waters broke and there was old meconium - which apparently is normal with an over due baby. The midwife on Bracken wasn’t happy so I was sent back up to labour ward. I was quite far on at this point so the move was not appreciated! On labour ward they insisted on me lying on my back with the monitor strapped to my belly. They couldn’t get a good reading of the baby's heart rate so the strap was getting tighter and tighter! I requested to go on all 4s, but the midwife wasn’t convinced as they couldn’t get a reading with me on my back so thought they wouldn’t be able to get a reading on all 4s either. Eleanor took off my monitor straight away got me off the bed and I gave birth on a birthing stool within the hour. Not the water birth I wanted, but it all worked out in the end. The breathing, the birthing positions and the couples workshop definitely enhanced our experience and gave both Robin and I the confidence we needed for an empowering birth. Thank you for your help advice and support throughout my pregnancy - I would definitely recommend active birth sessions to expectant mothers. time at home as possible. We were the only ones in Bracken (luckily). I didn't!! She also checked more frequently the baby's heart rate. in my birth plan and I felt really tearful and so happy. I used my birth ball a lot and found the breathing techniques excellent and did lots of vocalising too! was really peaceful. We came home the following day. and I feel that is down in the main to the classes and your teaching. Also, Malcolm and I really enjoyed the couple workshop in Exeter and feel that it prepared us well for the birth experience. Jasmine is an absolute joy to have and we are over the moon. Its World Breast Feeding Week from the 1st to the 7th of August. You can follow the link to find out more, or on a personal level you can just celebrate your own breastfeeding journey/potential.